A girl kneels over the grave of her murdered dog, praying for a miracle, while off in the distance, a man rides toward town on a pale horse. 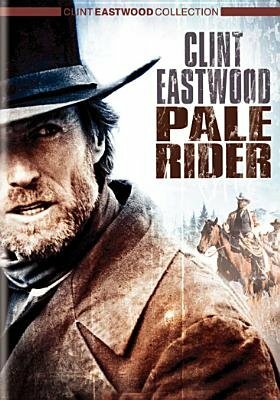 Clint Eastwood's PALE RIDER was the filmmaker's first Western in nearly a decade. It finds a pleasant balance between the mystical revisionism of films such as HIGH PLAINS DRIFTER and the traditional Western. Eastwood stars as the Preacher, who wanders into a dusty California town and tries to rescue a community of gold prospectors that is being terrorized by the local corporate mining operation, which is strip-mining the land. He's taken in by Hull Barrett (Michael Moriarty), who lives with Sarah Wheeler (Carrie Snodgrass) and her 14-year-old daughter, she of the murdered pooch, Megan (Sydney Penny). The Preacher is something of a blend of Eastwood's Man with No Name and the title character of George Stevens's SHANE. The story and treatment are straightforward and entertaining, and the strong performances draw the audience in. The Preacher remains a mysterious character, but in the end, as he takes on the evil mining corporation's hired guns, it's impossible not to root for him.